Below: April 2011 photos near Jefferson Memorial in Washington D.C. The Sarasota Bay Estuary Program (SBEP), Tampa Bay Estuary Program and Charlotte Harbor National Estuary Program are collecting images of the impact of king high tides the last week of October. 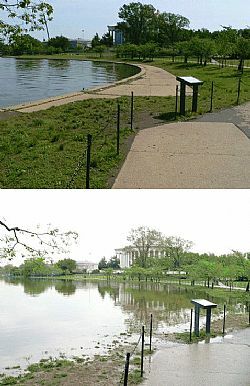 All three programs are part of a national effort to collect images showing the impact of the tides, which are expected to be two feet higher than normal. The increase in the tide depth is due to the combined gravitational forces and alignment of the moon and sun with earth. The higher tides provide local communities with a snapshot of how our coasts and landscape are likely to change with projected sea level rise in future decades. Many of the photos will be posted on the SBEP Facebook page and a special Flickr page at Florida Tide Watch. Participating photographers are encouraged to take photographs of local coastlines, flooded roads, pipes discharging water, and other areas with higher than normal levels of water. The best times to take photos include: Tuesday, October 25 at 1:17pm; Wednesday, October 26 at 8:26am, and Thursday, October 27 at 3:13pm. Photographers are asked to record the exact time and location of each photo. Digital images should be emailed to info@sarasotabay.org.